Pressure ulcers (or pressure sores/ bedsores) are wounds on a patient’s skin and underlying tissue which are often caused by extended pressure on skin. Medical conditions such as diabetes can increase the risk of pressure ulcers, as can conditions that confine patients to a bed, chair or wheelchair for long periods of time. Once an ulcer or wound has developed, it is difficult to monitor, measure and grade wounds. Conventional methods of measurement are inherently inaccurate, and it can be difficult to identify whether wounds are degrading or improving over time. Furthermore, NICE has emphasised the importance of measuring depth when monitoring wounds, but this is currently rarely measured. 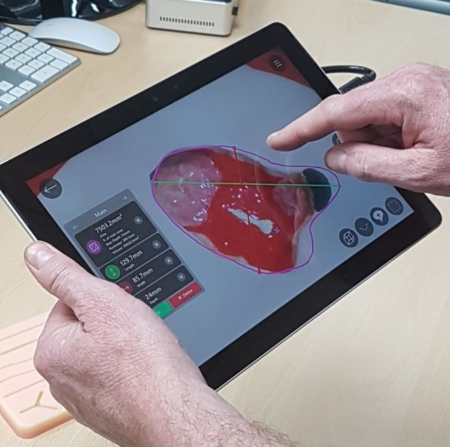 GPC’s 3D Wound Care device and software uses low cost 3D technology to ensure that accurate, standardised measurements are taken, that there is consistency of image capture, and it enables secure sharing of assessments across locations. Using 3D modelling, time accurate trend analysis of a wound can also be created. In real terms, the 3D Wound Care device allows clinicians, patients and family to understand whether wound tissue is healthy, decreasing in size and therefore healing, and whether the current treatment plan can continue. In an instance where 3D Wound Care shows that wound tissue is unhealthy, or the wound volume is increasing, clinicians and patients can take a proactive approach to treatment. HIN staff worked with GPC to clarify whether the 3D Wound Care system gave significant clinical and patient benefit that would justify investment in the system. In November 2018, HIN assisted with the development of a trialthat started in Guy’s & St Thomas’s NHS Foundation Trust and later included Queen Mary’s Hospital atOxleas NHS Foundation Trust. This 30-patient trial used the 3D Wound Care systemin both inpatient wards & outpatient clinics.